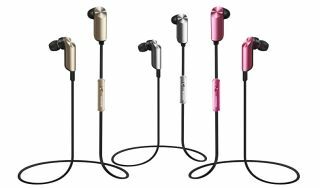 MWC: Huawei launches wireless TalkBand N1 "hi-fi" sports headphones | What Hi-Fi? Launched at the first press conference of Mobile World Congress (MWC) 2015, the Huawei TalkBand N1 headphones have 4GB of built-in storage so you can listen to music without a phone, and also offer basic activity tracking when synced to a smartphone. Huawei set the theme for MWC 2015 by focusing on new wearables and a smart watch rather than smartphones and tablets, and it's the TrackBand N1 that caught our eye. The N1 sports headset claims to be "the industry’s first hi-fi stereo and Bluetooth headset", with the Chinese brand claiming the TrackBand N1 uses "high quality loudspeaker components". Our definition of high quality speaker components may differ but clearly Huawei had sound quality in mind with the build and design of these new sports headphones. The TrackBand N1 headphones squeeze in 4GB of storage, so you don't need another device on your run or at the gym in order to listen to music. They also offer aptX Bluetooth wireless streaming should you want to play music from a smartphone. Paired with a phone, the TalkBand N1 also offers activity tracking, promising basic functions such as counting your steps, tracking the distance of your run and tracking calories burned. Due on sale in May, the Huawei TalkBand N1 has a price tag of 119 euros, so we'd expect it to come in at just under £100 in the UK. The N1 was launched alongside the B2 wristband and Huawei Watch. MWC 2015 is expected to see the launch of flagship phones from HTC, Samsung and possibly Sony, with press conferences from HTC and Samsung later today [Sunday].